Good bye, 2014. Hello, 2015. In looking back at 2014 I see it involved a lot of completions – clearing out the old, and making room for new things – and beginnings – laying the foundations for future work. Time to head into 2015 and take advantage of all that groundwork. Thankfully, Michael and I, and our immediate families, all stayed mostly healthy, happy, and sound all year. *whew* Plus we celebrated out 25th anniversary. Most of the first half of the year was consumed with managing a whole-house renovation. There are still bits and pieces to be completed, but for the most part we now have a home that is much more pleasant and functional, and supports us better in our respective activities. Throughout that time I was dealing with our donkey Eeyore’s worsening arthritis. I tried to keep him comfortable, and he had his good days, but was trending in a bad direction. Eventually, in July, we elected to give him the easy way out. Now Clementine is on her own. She was doing well, but now seems to be having trouble with tendinitis or something in her front legs. Having the vet out, again, tomorrow, to see if there’s anything we can do to help her heal and get off pain meds. Right now she’s not very happy, and I’m hoping she doesn’t follow the same trajectory as Eeyore did. Because of other priorities and limited finances (career transitions can be hard on one’s bank account, after all) I didn’t get to as many seminars as I would have liked. But I did participate, as usual, in the Bridge Seminar in San Diego and the O Sensei Revisited Retreat with Robert Nadeau Shihan and his senior students/instructors. Both of those are really worthwhile events, and I’m glad I was able to make it to them. Also, finally, after years of wishing, I took the train to Seattle (2 days each way!) 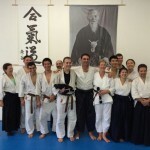 and participated in George Ledyard Sensei’s Randori Intensive at Aikido Eastside. It was a blast. Highly recommended! I hope to be able to do all three of those seminars again this year. Definitely the San Diego Bridge Seminar, which is in just a couple of weeks. 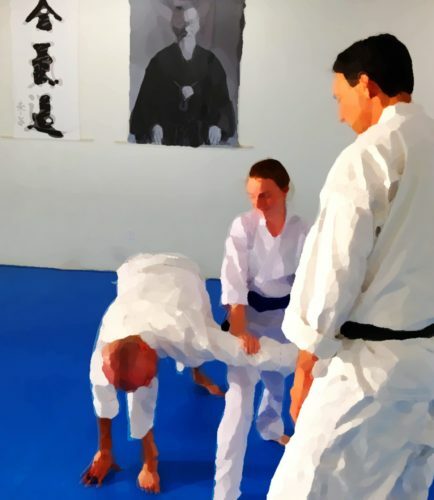 And this year there’s a new retreat that I’m really looking forward to – the Joshua Tree Evolutionary Aikido Retreat with my teacher, Dave Goldberg Sensei (Aikido of San Diego), Patrick Cassidy Sensei (Aikido Montreux, Switzerland), and Miles Kessler Sensei (Integral Dojo, Tel-Aviv, Israel). It’s going to be a pretty spectacular event, at a historic retreat center in the Mojave Desert in February. The Aiki Summer Retreat is reported to be happening again this year, and I hope to make it to that as well. After the house project was done I got busy studying, and passed the test for my ACE certification as a Group Fitness Instructor, then went right on to get certified to teach SilverSneakers Classic, Circuit, and Yoga classes for seniors, and began the process for offering their FLEX Community Fitness classes. At the same time, I clarified the concept, created branding and marketing materials, and launched my company, Fit Coach Linda. Its mission is to support people in getting moving, and living active, healthy, happy lives through better connection with their own bodies, with nature, and with others. Right now I’m designing programs and materials, and arranging for venues. I should have had that up and running for New Year’s. Alas, too much to do at once. I’ll have to catch people as their resolution motivation is waning, and they realize that a supportive group environment and accountability is more likely to lead to success than determination alone. If you want to be a part of this, you can follow my Fit Coach Linda Blog for info and inspiration for living a more active life, and also “Like” the Fit Coach Linda page on Facebook. As always, I enjoyed training all year at Aikido of San Diego. In December I passed my shodan (blackbelt) exam. 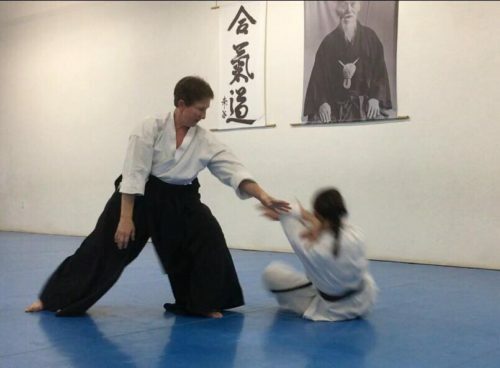 I’m looking forward to “just training” this year, and deepening my understanding and application of Aikido. The Joshua Tree Retreat will be a huge part of that, I’m sure. I didn’t meditate as much as I would have liked in 2014 – must incorporate that into my regular practice this year, too. Between the renovations, donkeys, studying, and training, I didn’t get as much writing done as I should have. However, I was able to make tons of progress on two books (Aikido-specific, for students, to be published in the next few months), and some progress on a third (non-fiction/self-help, maybe later in 2015). Writing – actually publishing books via my other company, Shugyo Press – is my “day job,” along with the programs I’ll be teaching for Fit Coach Linda, so I need to be diligent about actually getting that work done this year. But before any of that, today is the first day of New Year. I’ll be celebrating by heading to the gym to work with my personal trainer, Kyle, of San Diego Strength and Conditioning. A very nice guy who knows what he’s doing, and his facility is right next to the dojo. Perfect. Part of my own strategy to make 2015 an even better year. It seems like I’ve been checking things off to-do lists and taking care of details for days. Finally in the last few hours before exam day, and pretty much on top of things. A few of us cleaned the dojo earlier, and set up chairs for guests last night. Someone pointed out it was my last time going home as a kyu-ranked student. Acck! Today I had some notes to write and errands to run. I’ve got my gi (and new hakama) packed up and ready to go in the morning. My stuff for the dojo holiday party afterward is ready to go. I just need to get the coffee pot set up so I don’t need to fiddle with that in the morning, and have Clementine’s morning food ready except for adding hot water. I have a little writing to do, and want to run through things in my head once more. And then I think I’ll set every alarm clock I can find and try to get to sleep. Looking forward to giving it my best. Learning to surf, with my friend Karen (whose brilliant idea is was). How did I grow up in Pacific Beach and not learn to surf? Trail running. I am not a runner, by nature, but for some reason that’s been calling to me for a while now. Snowboarding, maybe. No specific plans to go, but I’ve always wanted to try it. Strength training. Yeah, I’ve been doing my PT exercises and swinging a kettlebell a little, but I want to get a little more serious about it. Going to the local trampoline place – wall-to-wall trampolines – and playing. Who’s in? Working more on suwari-waza and hanmi-handachi-waza (techniques from a kneeling position). I’ve been enjoying training in those, but don’t dare overdo it. Gardening. The yard is starting to green up with recent rain, and more on the way. Perfect time to tidy up, and get the raised-bed veggie garden ready for planting. Finish some house projects. OK, not really looking forward to doing those, just looking forward to putting them behind me. Writing. There are some books that need to be finished and turned loose on the world. Getting my business going – Reconnecting Ourselves – and beginning to lead group programs to get people moving, and get them connected to their own bodies. More than anything, though, I’m looking forward to being in class on Monday night and just training. A week from Saturday, on December 13, 2014, my friend David and I are scheduled to test for shodan (first black belt, or “beginning rank”). Tonight is the final (yikes, that word, final…) run-through. On the one hand, it’s just a test. Afterward I will show up and train just the same as before. But it’s also Kind of a Big Deal. 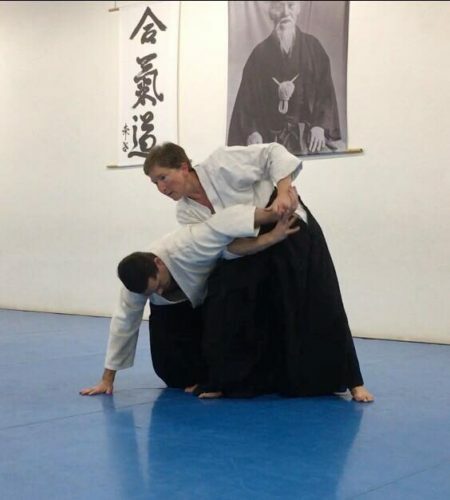 I’ve been training for a bit over five years, and for the past year working diligently with David and our sempai (senior students) to refine and polish our techniques. I’m sure I have improved, but it’s the kind of improvement where you finally catch one thing, and see two others you need to work on. It’s easy to feel overwhelmed and incompetent. As with any big deadline in life – a trip, graduation, marriage – there are a lot of little things to coordinate as it approaches. I paid my exam fee months ago, just so I wouldn’t have to have it on my mind, but still have my association fee to take care of. Shodan is the rank at which the international association starts to care that you exist, so there’s a registration fee for that. Up to this point I’ve only been an anonymous student at my dojo, as far as the outside world is concerned. I actually bought two hakama – those black flowing skirt-like pants-chaps things – several years ago, at 4th kyu. I knew I would get here eventually, and my favorite gi supplier was going out of business, so I snapped them up. I finally took them out of the package and tried them on a couple of weeks ago. One fits (the other needs to be tailored), so I have one I can wear afterward. Something else I can check off my to-do list. Whew. My current gi (training uniforms) are falling apart, so back in July I tried to have a new one made locally. The tailor is still working on it. So… Not counting on that to be done on time, or done right. I ordered a new one online. It needs some simple work to make it right, so at least I should have a decent gi to wear on exam day. I’ve been very careful to stay healthy and sound. Interesting… When it matters (and doesn’t it always matter? ), there’s a lot we can do to fend off whatever is going around, and to avoid injury. I started noticing this right from the beginning of my training – that as a test or seminar approached I could be a lot more assertive about protecting myself from everything from random coughing people to stupid risks like working around Clementine, our donkey, in flip-flops. The thought “oh, it’ll be OK this once” goes right out the window when the consequences of a bad cold, a pulled muscle, or broken toe are so high. During our previous run-through we discovered I was not breathing freely. I was holding my breath and getting winded. A lot of that was tension – both from being under pressure, and from other things going on in life. But also I actually was having trouble breathing! I noticed as I tried to focus on breathing more freely that I really couldn’t. Breathing through my nose was like breathing though one of those little plastic stirring straws. And when doing techniques I tend to keep my mouth closed, so I really wasn’t breathing enough at all. It was off to the doctor about that, where I learned I have a deviated septum partially blocking airflow on the left, and a nasal polyp clogging up the right side. Aha! So I’ve been using a nasal spray to try to reduce that problem, and it’s been helping. Then on Tuesday I realized I was set to run out of my nasal spray just a few days before the test, so I just took care of getting a new bottle. Now that exam day is just over a week away I’m down to the fiddly stuff. I want to clean out my car. I feel unsettled, unworthy, and ungrounded when my car is a mess. I’ve been meaning to clean it out for months. Gotta get that done. And as any big date approaches I refuse to try new restaurants or take other seemingly minor risks. A case of food poisoning a few days before an exam would not be cool at all. On the mat I’m finalizing some things I need to have memorized – which techniques I’ll be demonstrating for certain parts of the test – and ironing out the details of anything that feels a bit iffy. But the biggest thing is settling down and trusting that I’ll do my best. “Find your ground,” one sempai says. “If anything goes wrong, just relax and continue – don’t let it take your focus,” says another. Connect, and stay connected. Don’t rush – be earlier. Take center, and don’t give it back. Be clear and ruthless – not tentative or cautious. Use your hips. Use the ground. Move into the space. Be the space. Relax and breathe. You know how to do this.